This is the second tarot that I know of that has been published this year, and both decks are on the most opposite places of the spectrum possible.Where the other zombie tarot was tong in cheeky and kitschy in a good kind of way this one goes all the way in gore and horror. Joe Frost used photo's from a variety of artists around the zombie-theme to link to the 78 arcana + one extra card named Undeath, fact is that the images do not always speak for themselves. Due to as good as no identifiable elements from the major arcana or suit symbols, any esotheric pointers linking a card to an imaes is not always simple or logical, where some images can clearly be linked to a card others can only be identified by the title printed upon them and are mutually interchangable. For anyone really into zombies, with a sub-categorie of realy dark decks in their collection or who just want to have the most distressingdeck for those halloween readings this might be the deck for you. Alchemy 1977 is a brand well know for its gothic and steampunk imagery and products,that enjoys a vast number of followers and has a big catalogue of images. Every image is set within ornamental frames augmenting the cohesive feeling between the cards and also the dark gothic feel of the set. All in all a very nice deck, no deep mystical secrets hidden in it, no high art, just 78 dark cards for those into something more dark. The decks is available from the usual places like Tarot Garden or Alida or other shops near you or on-line that sell tarot. It seems that zombies are back these days from never really gone, only buried just below the surface, and you know these things come back when you don't expect them ...and with a vengeance. 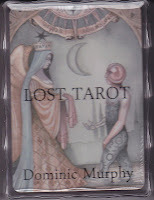 So the tarot-world could not stay behind to our (or at least mine) delight - and in my collection this one went. 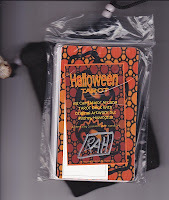 One of the authors behind the Zombie Tarot was also behind the "Housewives Tarot" and together with Stacey Graham he has applied the same style, feeling and tongue-in-cheek humour as there to this deck. Bathing in a fifties to sixties B-movie atmosphere with matching colour palette sure to work upon both the nostalgia as the sense for pleasantry. The whole vintage undead theme is well worked out from the sturdy casing reminiscent of a ammunition box with the following tekst printed upon it: "insight & ammunition for surviving the undead uprising" the tone has been set and in this vein it will continue in the most hilarious way throughout the deck iself and its instruction manual.. The setting for the deck (and the one using it) is an apocalyptic world with zombies taking over the world and the remaining humans trying to survive - provided with this deck and the boockled and it's wicked sense of humour you sure will, and while doing so staying cool and good-looking! The images where created using good old Victorian style stage-illusion techniques, waxwork sculptures and the interplay of light and shadow, no photoshop or other digital manipulation after the images where taken was applied- perhaps this too contributed to the power of this images, no slick or polished cards but pure horror and madness. The deck follows the downfall of the town of Wormwood (as the herb used to produce the ill-famed liquor Absinthe that is present in almost every card and dragging everyone down into insanity ) and its inhabitants into a hell the story of it described in the codex that gives a kind of biography of each card/personage of the deck, information also about its divinatory meanings at the same time. Where every major, court card and the extra card "baron Alchymus (around who's actions and experiments everything evolve and drags the down into decay, insanity and a world full of abominations of man and nature) depict a person who's story represents it, the minors 1-10 show dark-inimistic scenes. The images on the cards and the stories in the codex are miles away from the classic tarot but yet for a coherent system and for those into some (or much) darkness it is something they might get into their collection. From the same artist as the "Wonderland Tarot" I mentioned here last July, in the same style colorful, playful and with a large dose of healthy madness. Featuring all kind of Halloween creatures and settings ranging from the adorable to the creepy and everything in between, yet due to the style and flashy images it still remains a deck you can take out and show to adult and children alike without leaving the behind disturbed and in shock. This is one of my favourite gothic decks, elegant even seductive yet with a darkness that gets deeper every time you look into it...and the better you look the more disturbing elements you notice. 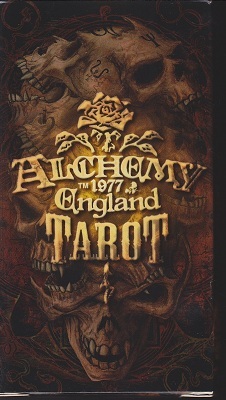 Already into its second and revised edition (the first edition printed in 2007, in a normal an an silver edition where elements of the cards got highlighted in silver ink, was immediately voted "Deck of the Year" on the Aeclectic Tarot Forum, the second edition followed in 2010 and is now sadly out-of-print) the deck is and remains a very popular item. The artists hope to reprint the deck in 2013. 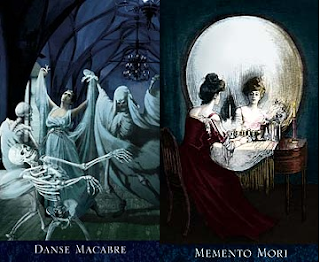 As with every the Bohemian Gothic Tarot came with an extra card for the 1st edition this was the "Danse Macabre" for the second one it was the "Memento Mori card"
Combining Victorian elegance, restraint and dark drama, without being over the top or kitsch. 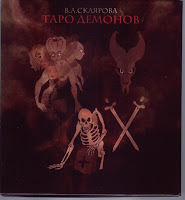 Insane persons, monsters of every kind and genre, grand scenes composed of many many elements perfectly collaged to form a new, darker vision upon the WCS-tarot. Halloween is one of those special times of the year when we like to dress everything up, ad a pinch (or much more) to every aspect of our life, also when it comes to tarot. So I decided to make a series of Halloween-themed posts showcasing those decks that are perfect for this time of the year, each new deck I post about will be listed here with a link to the blogpost. Earlier this year in April (from the 7yh to the 29) there was be an exhibition of the major arcana paintings by Antonio Possenti (1933° - ), these where printed into a limited edition of 1000 decks celebrating the inauguration of the new headquarters of the Vallardi Galleria D'arte where the y where shown. The cards are airy and have a certain sense of humour (perhaps coming from his his background as a political cartoonist), combining this sense of humour with his poetic surrealistic style the 22 resulting arcani are vibrating with a semi-wild/untamed energy and a light and joyful outlook. The images display also a somewhat gentile chaotic, in a sense childlike innocence ...while at the same time showing the master-craftsmanship of the artist not unpleasing to me, but perhaps not everyone's cup of tea.. The deck can be obtained from the Vallardi Galleria D'arte or from the gallery's eBay shop at the very democratic price of € 25 + shipping.